The Mary Slattery Benefit Fund has been an overwhelming success. Mary and the organising committee wish to thank all those who helped in any way during the course of our fundraising. Thanks also to those who donated, cut, felled or delivered timber, gave auction items, spot prizes, our auctioneer, those who provided entertainment and to everyone who made the night in Stapleton’s Pub such a great success. We would like to thank those who participated in and organised the ‘jersey day’ at St. Josephs Secondary School, the Track Attack 2 mile fun run/walk, the Bush and Briar walk and the Borrisoleigh 40km cycle and An Garda Siochanna for their assistance. Thanks to all who provided food/refreshments and catering facilities over the weekend and to those who assisted with our advertising campaign. To all who donated so generously to the fund, purchased timber and auction items, raffle tickets and helped in any way. Total monies raised to date: €18,931.00. This money will be used to extend Mary’s kitchen, provide a downstairs bedroom and bathroom and make her home more wheelchair friendly which will enhance her day to day living. A special thanks to those who have offered to travel to the UK to assist with the renovations. Your generosity has been greatly appreciated. There was a special delivery to The Bothy! There is now a Santa post box in The Bothy. Any child who posts their letter here will get a personalized reply from Santa within ten days. Replies can be collected from the Bothy. This year the Christmas Tree lights in The Square will be switched on at 7pm on Sunday 6th December. There will be entertainment beforehand with Fire Spinners while the DJ plays some tunes to get the atmosphere going and Carol singers to add some festive cheer. We also expect a visit from a jolly man from the North Pole! This year sees a new initiative to promote shopping local. Borrisoleigh Community Development Association in association with Borrisoleigh Festival Committee are producing a flyer showcasing offers available during the Christmas period from retailers located within Borrisoleigh. A draw will also take place for prizes of vouchers that can be used in any of the participating retailers (more details to follow). Any businesses who have not yet sent in the offer/s that will be available, please forward on asap to derryodonnell@gmail.com. Remember to support local businesses this Christmas! Money spent locally stays locally! John Ryan and myself, Nicky Cooney of St Joseph’s College, Borrisoleigh had the privilege of attending the Transition Year Physics Experience (TYPE) in Trinity college Dublin. To start our wonderful experience we listened to an introduction from Prof. C McGuinness explaining what lay ahead for us and how lucky we were to be there. He wished us a week of fun learning. All of our lectures took place in the famous Schrödinger theatre. Schrödinger was a famous Austrian physicist that wrote the book ‘The Meaning of life’. At the start of the week we were assigned projects to research and present at the end of the week. John’s project was based on Carbon Nanostructures and my project was based on Galaxies and their shapes. During the week we attended many lectures and talks from various experts in their specific fields. The lectures that I found most fascinating were on the topic of nanophysics and astrophysics. Particle physics piqued John’s interest the most. The professors were so enthusiastic when giving their lectures especially Professor Eric Finch, a renowned physicist who gave a riveting lecture on ‘The Powers of Ten’. As soon as he started the lecture every student was so intrigued by his enthusiasm and he maintained our full attention for the entire talk. We were left in complete awe. Nanophysics was really interesting to me. We had various lecturers for this particular subject such as Arlene O’Neill and Valeria Nicolosi, an Italian physicist. These lectures grabbed my immediate attention because these nano particles are the solution to our energy problem globally. Our final lecture at the end of the week finished with a bang, literally. We studied particle physics which was so much fun and it answered a lot of my questions about our universe and what it is made of. We went on a trip to Birr Castle Observatory during the week which was brilliant because we were shown the telescope that was at one point the biggest telescope in the world. We went to see how we can measure solar flares and how this affects our planet. This is the famous LOFAR project. Solar flares can interrupt certain things on our planet like communications and radio. Collecting data from these flares is important because if we are to understand them, we must study them and Birr castle gives a huge contribution to that study. On the final day we presented our projects. Judges came around to each project to ask us certain questions on our project and what we had learned. There were prizes given for these presentations and their content. Luckily enough, my project on Galaxies, was chosen for the prize. This was a great end to a fantastic week. On Friday last, 13th November, we held a jersey day to raise money for the Mary Slattery Benefit Fund. The day was a great success and we donated €370 towards the fund. With just 3 weeks remaining in the Planet Track-Attack Series, Mary McLoughlin is the new leader of the “Stars” group which is competed for over a distance of 2.7km. Her time of 17:16 in round 7 earned her a total of 36 bonus seconds and her work will now begin to defend the lead she has carved out until the final night on December 4th. Mary’s closest competitor is Eimear O’Donnell who has shown excellent form in recent weeks while previous leader Sinead Ryan now lies in third place overall. It looks like there are champions in the waiting in the 3 other groups competing over the 2.7km distance. Elaine Ryan holds a 5 minute lead in the Moon group, Joey O’Dwyer has carved out a significant lead in the Sun group while Luke Mockler is the strong favourite to take the Galaxy title. We also have a new leader in the Space group which is part of the 4km distance. Betty Slattery is starting to find her form of old following a prolonged period of injury and has now worked her way to the table topping position following a Personal Best time of 22:41 for the Series in round 7. Phil Mason will battle her all the way to the final night and she is currently only 18 seconds in arrears so we should be guaranteed a super finish to the group. The current leader of the 5 other groups within the 4km distance are Aaron Reid, Oran Bergin, Eamon Groome, Christine Rabbitte and Noreen Ryan. The 6km course record was beaten in round 7 when Declan Doherty crossed the finish line in a time of 23:21 which was 2 seconds better than Andy Quinlan’s previous best. Andy’s lead at the head of the Mercury group is under threat as a super run by Liam McCullagh have closed the gap to just 49 seconds with 18km remaining to run in the Series. Mick O’Meara and Siobhan Carey look like they have their respective groups in the bag providing they don’t pick up any penalties for missing a night. Denis O’Connell, JJ Kinane and Eamon McGrath are the other 3 league leaders and all 3 will have to keep the hammer down over the remaining rounds as their closest rivals are still within touching distance and could well launch a title winning challenge. Rudolph’s 4km Run will be held in Borrisoleigh on Friday 11th December starting at 8pm. The run is AAI permitted and will be chip timed by Premier Timing Services. The course will be part road and part track, all under lights so it should be a unique atmosphere on the night. The run will be preceded by a 2km fun walk starting at 7pm. We are also putting together our list of sponsors for the event and to date we’ve got a very positive response. Track-Attack would like to thank the following who have kindly signed up to be an event sponsor: Cross Fabrication (Paudie Meehan), Latteragh Crafts (Christy Slattery), Declan Maher Financial Services Ltd, Borris-Ileigh GAA Club, Pat Keane Painter & Decorator, Templederry Childcare (Aine Costello), Tipp Tatler (Derry O’Donnell), Healy Lawnmowers (Thurles), and Shortt’s Drapery (Templemore). If any business or individual would like to be one of our Rudolph Run sponsors, please just contact Declan Maher at 087 1444977 or Pat Keane at 087 6380649. The cost of been a sponsor is €50 and for that, your advert will be displayed on an advertising board at the entrance to the Borrisoleigh Track for the next 12 months. You will also be mentioned in our various weekly notes and on our Facebook page. St. Cualan’s in association with the Borrisoleigh Active Social Club are hosting the annual Christmas party on Sunday 6th December. Mass will be celebrated at 2.00pm, followed by dinner, music, dancing and song in the Community Centre. If you would like to join in the festivities and get in the Christmas spirit, please give your name to Lucia, Eileen or Dolores before the 2nd of December. Our November lecture, “Drifts and it’s Dangers”, detailing events in North Tipperary between the truce and the outbreak of Civil War, was another huge success. As well as the delivered lecture, in the course of the question and answers that followed, John Flannery treated us to the story of Denis ”Sonny” O’Neill and the shooting of Michael Collins. On December 7th, we welcome back Sean Hogan. Sean is the much acclaimed author of ”The Black and Tans in North Tipperary”. On this occasion, Sean will lecture to us on the life of Seamus Burke of Rockforest. Burke, who was elected as a Sinn Fein TD in the general election of 1919 and remained a TD until the late 30’s, had strong Borrisoleigh connections. His parents hailed from the parish and he is buried in Glenkeen graveyard. This lecture is one that we eagerly look forward to. Monday, November 30th, will be a special evening in Borrisoleigh. On that day, three guides from Medjugorje will visit our parish and will speak in the Sacred Heart church. These guides have been long associated with events in Medjugorje. For many years they have acted as translators to the visionaries and to the priests of that special place. It would be true to say that they grew up with happenings that began there in June of 1981. For to hear their amazing stories and testimonies; Mass and Rosary will begin at 7.00pm followed by the talk from the guides. After the ceremony, tea and refreshments will be served in the Community Centre, where our visitors will be available to meet with us. New Development: As many of you have probably seen by now, a new development has begun to take place in the town park. This is quite a large scale development and hopefully will leave the parish with one some of the best, if not the best, facilities in the county. We hope to have this development up and running in the next few years and looking forward to people enjoying these marvellous facilities. As stated, our plan is to have state of the art facilities for the people of Borrisoleigh. This will consist of the following; the building of a state of the art multi purpose sports complex that will house our sports hall, ball alley, gym, 4 dressing rooms, meeting rooms, external floodlit hurling wall, kitchen and toilet facilities and also a viewing area out on the pitches. We will also complete the floodlighting of the now extended walking track, the building of a third playing pitch, the re-development of the tennis courts and the re-development of the soccer pitch. As you can imagine this will not come cheap, and we hope that with the support of the parish, we can complete this development within the next few years. We are proposing a fundraising scheme where we can claim back tax on a charitable donation. We are proposing that people give a donation that equates to €4.80 per week for 3 years by standing order which we hope will finish paying for the development. We hope as many people as possible will become involved in this scheme and help us give the people first class sports and recreational facilities in the parish. AGM: The time of year has come around again for our AGM. We will hold it on Sunday 13th of December in the pavilion. Any nominations for any of the positions are to be with Gerry Treacy no later than December 1st. The county final of Scór Na nÓg took place in Cashel last Friday night. There was great excitement when Borrisoleigh were announced as winners of the Solo Song and Léiriú. Congratulations to Katie, Adam, Razuk, Lisa, Colm, Kayleen and Katie. The Munster Semi Final of Scór Na Nóg will take place in Cashel on the 6th December. All support would be greatly appreciated. We are holding a Fashion Show in February. Tickets for the show will be on sale shortly. A great stocking filler for Christmas. Our Church Gate collection takes place this weekend on November 28th & 29th, your support would be appreciated. 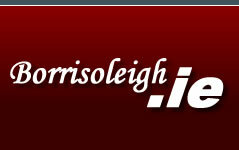 Like us on our Facebook page Borris-Ileigh Camogie for up to the minute updates. Merchandise is now available to buy with the Borris-Ileigh logo on the O’Neills website, www.oneills.com Input Borrisoleigh in the search field to see the range available.